Schaumburg may seem like an unlikely home base for one of Chicago's most in-demand blues singers, but Robert Covington is not your average bluesman. 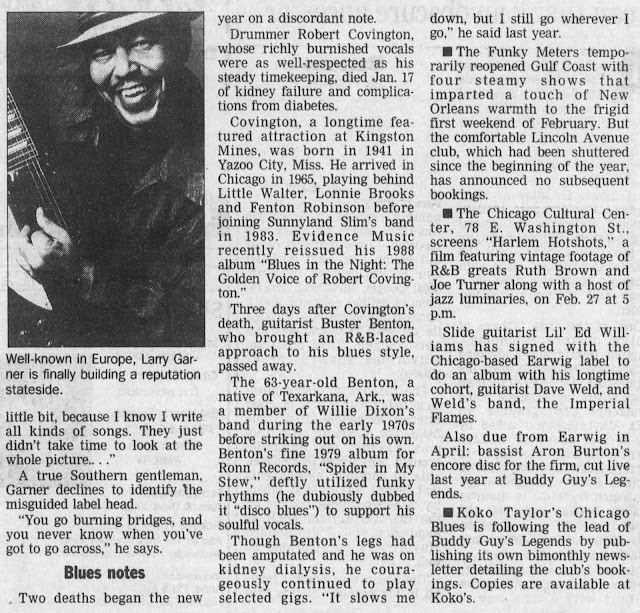 A native of Yazoo County, Mississippi—the birthplace of such blues icons as Skip James, Tommy McClennan and Robert Petway—he came north to Chicago in the mid-1960s and has lived in the northwest suburbs for the last 15 years. Often performing seven nights a week in city and suburban clubs either with the house band at Kingston Mines in Lincoln Park, with the group Mississippi Heat, or with his own band, which bears his name, Covington is one of the few blues drummers who's successfully been able to come out from behind the drums and achieve frontman status. With a buttery baritone that recalls such classic blues singers as Bobby "Blue" Bland and Little Milton, there was no way that Robert Covington was going to remain hidden behind the drums forever. 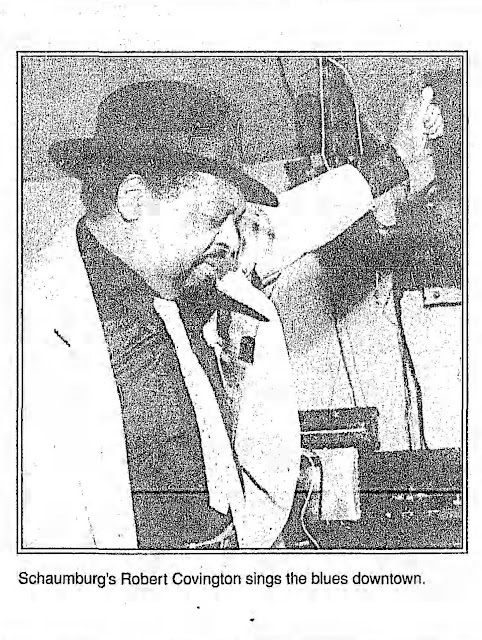 Working the crowd on a recent Wednesday night at Kingston Mines, decked out in a three-piece suit and fedora, his declamatory vocal style on both originals and blues classics like Willie Dixon's "1 Just Want to Make Love to You" virtually lights up the room. On his own "Better Watch Your Step," Covington goes into an extended rap about his woman cheating on him. "1 know you weren't out with your best girlfriend last night 'cause she was with me!" It's a clever lyrical turnaround typical of Covington's approach to his music: "Don't just sing a song—tell a story." "That man can sing some good blues," said octogenarian blues piano legend Sunnyland Slim, with whom Covington performs on drums and vocals Sundays at B.L.U.E.S. on Chicago's North Side, "He's a good drummer and a good man—he's excellent." It should be noted that Sunnyland, who helped launch the careers of such blues giants as Waters and Wolf, is notoriously parsimonious with his praise. An-other Covington booster is Doc Pellegrino, owner of Kingston Mines, where Covington performs five nights a week. "Robert puts a lot of heart and soul into what he's singing, and when you're in the audience it's as if he's singing just to you," he said. "And the people really seem to love him." Indeed, at the end of his set Covington is surrounded by both new and old fans, all waiting to pay their compliments. "Sometimes onstage you have such a feeling of control, like you have the audience in the palm of your hand," said Covington after the show. "It's like you can't do or say anything wrong." Covington lives in a neat-as-a-pin ranch house just off Roselle Road that he shares with his wife, Ernestine, and daughter, Tiffany, a junior at Schaumburg High School. A son, Keifer, a senior majoring in criminal law at Southern Illinois University, worked for the Schaumburg Police Department as a bicycle patrolman this past summer. Wearing a blue T-shirt and dark glasses, Covington's gravelly voice reveals that he's recently climbed out of bed, having worked until 4 a.m. the previous night at King-ston Mines, No overt signs that a musician lives there are obvious. In fact, the decor bears the distinct signs of Ernestine's feminine touch. Covington credits his wife, affectionately known as Ernie, with his move to suburbia. He finds the relative peacefulness of suburban life an antidote to the boisterousness of his work world. "Ernie Covington, who owns the Schaumburg resale-consignment shop Next To Nothing near their home, offers a portrait of the bluesman as homebody. "Robert likes to cook, and he's a good one," she said. "His specialty is seafood, especially fried fish. I know that when I come home from work we're going to eat fish nearly every day. The only time I can get the fish smell out of the house is when he goes on tour to Europe. "He also likes cleaning the house. When he's not working he's really a homebody," she added. "He's not into hanging out like many musicians are. He'd rather be at home watching videos." Covington's route to suburbia has been an interesting one. Born in Yazoo City, Miss., 50 years ago, he spent three years at what is now Alcorn State University. But despite his mother's desire for him to be a teacher and his own interest in journalism, music eventually won out. 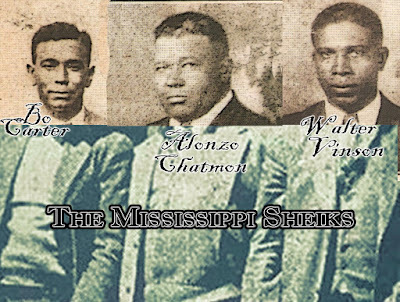 More specifically, when the bandleader for rhythm and blues kingpin Big Joe Turner put out a call that they needed a drummer for some Mississippi shows, Covington answered the call. "I was no Gene Krupa back then, but I got pretty good playing drums in college," lie said. With such hits as "Shake, Rattle and Roll" and "Honey Hush" to his credit, Turner was a certified legend, a larger-than-life figure with a booming voice. Covington's first professional gig was one he'll never forget. "We're all up onstage at the nightclub waiting for him to come on, and I was real nervous because I still hadn't met him," said Covington. "You see, he never came to rehearsals. Finally he comes waddling through the crowd to get to the stage and I could immediately see that he was stone drunk. When he finally got on-stage, he was weaving and rocking so much that he finally just tipped over the front of the stage and fell right off it. Bottles and glasses were flying all over, the audience was screaming, and I started laughing. I couldn't help it. The bandleader fined me $25 for laughing, and I was only making $15 a night." Such was Covington's initiation into show business. Later he led his own band in Mississippi, com-ing north to Chicago in 1965 to escape an ill-fated first marriage. Knowing no other musicians in Chicago, it took him awhile to establish himself in the blues hierarchy, so he worked the second shift at factory jobs to pay the rent. "I started to sit in at juke joints on the South and West Sides when I got off work," he said. "I used to go into some of the most danger-Otis places you ever saw, but that was where you found the real low-down blues." Gradually he worked his way up in Chicago's insular blues scene, playing both on stage and in the recording studio with a who's who of blues stars that includes Buddy Guy, Junior Wells, Lonnie Brooks, Fenton Robinson and James Cot-ton. By the mid-1970s he was a fixture behind the drums at the city's North Side blues clubs. Covington's secret weapon was a singing voice that was often better than that of the people he backed up. 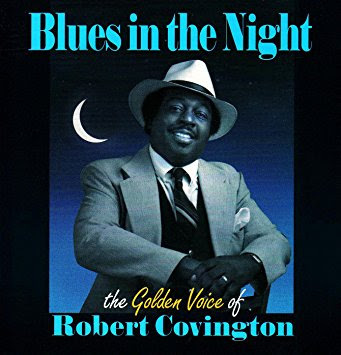 The title of Covington's 1988 album on the local Red Beans record label, "The Golden Voice of Robert Covington," is no brag. His longstanding Sunday night gig with Sunnyland Slim aside, it's rare these days that you'll find Covington behind a drum kit. Now he's a legitimate frontman. "I recognized the quality of his entertaining ability, and it was get-ting lost behind the drums," said Kingston Mines' Pellegrino, whom Covington credits with helping establish him as a singer who also plays drums, as opposed to a drummer who sings. "I convinced him to come out from behind the drums, and now I think he's really a great entertainer." "No matter how good you are, people always look at drummers as just sidemen," said Covington. "I figured I'd wait until it was my time, and now it is my time." There's no doubt that Covington is serious about his career. With his steady gig at Kingston Mines, work with Sunnyland Slim and occasional dates with Mississippi Heat at clubs like Slice of Chicago in Palatine, Covington is perhaps the hardest-working man on the blues scene. "The thing is, I remember those lean years when I first came to Chicago and was wishing for work," he said. "So now I'm sort of superstitious about turning work down. In this business it's ei-ther feast or famine. And luckily right now I'm feasting." "Robert lives for his career," said wife Ernie. "The only time I've seen him really upset is when he had kidney problems five years ago and was on dialysis. His doctors told him he had to give up playing music, but he's tough. He really loves what he's doing. If he had to choose between giving up his music or giving up me, I'm not sure which he would choose." After his kidneys failed as a result of complications of high blood pressure, Covington had a kidney transplant. He says that his brush with death totally changed his outlook on life. "Before that I used to take life for granted," he said. "I just didn't give a damn. But now I have a sense of purpose, so 1 try to make every day count and be meaningful. I try to instill that in my kids, that there are no shortcuts in life. We were all put here for a reason and we should find the best way to make things happen for our-selves." One place where Covington is especially in demand these days is in Europe. Just back from his third European tour this year alone, Covington, like many Chicago blues musicians, relishes his jaunts overseas. "There's a big, big market for blues and jazz in Europe," he said. "The people respect the blues so much more there, especially traditional blues. They know who you recorded with, who you played with, everything you've ever done. They treat you like a king. "You know, I've come a long way, and I'm proud of what I've accomplished. My mother and father never left Mississippi, nor did a lot of the friends I grew up with. I wish they could have seen sonic of the places I've been to and met some of the people I've met. Every time in an airplane flying off to Europe I think to myself, 'Damn, not bad for a country boy from Mississippi!'" In January 17, 1996, Covington succumbed to complications from diabetes. Chicago Tribune, Feb 16, 1996.